Nicholas Ryan is an Amazon Top Ten Bestselling Horror author. When Steve Bannon and the crew of the fishing boat, 'Mandrake' sailed into Grey Stone harbor, they arrived into the very jaws of a zombie war. The zombie apocalypse has overtaken the coastal town and Bannon must fight for his own survival in a horrific world filled with unimaginable peril and betrayal... at the highest, and the most personal levels. 'Dead Rage' is a white-knuckled ride into the frenzied terror of the zombie apocalypse, where friends become enemies and every step is a life and death struggle. A novel of over 68,000 words. 'Ground Zero’: A Zombie Apocalypse - "A bloody zombie smash!" DJ Molles, author of 'The Remaining' series. 'Die Trying’: A Zombie Apocalypse - "A heart stopping zombie thriller!" DA Wearmouth, author of 'First Activation'. Writing a compelling zombie novel takes a lot of work, and a lot of research. 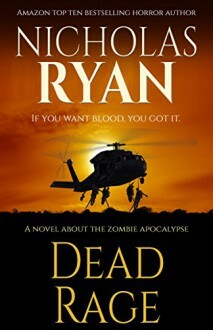 For each of my zombie ebooks I have had a great deal of help from former soldiers, but this novel about the zombie apocalypse has required some specialized research. I am very grateful to the helicopter pilots and special forces operatives who guided me through the combat encounters in the book. Their contributions added greatly to the extensive zombie warfare sequences.